Many reptiles like and actually need to climb. Chameleons, for example, live mostly in trees. What about bearded dragons? 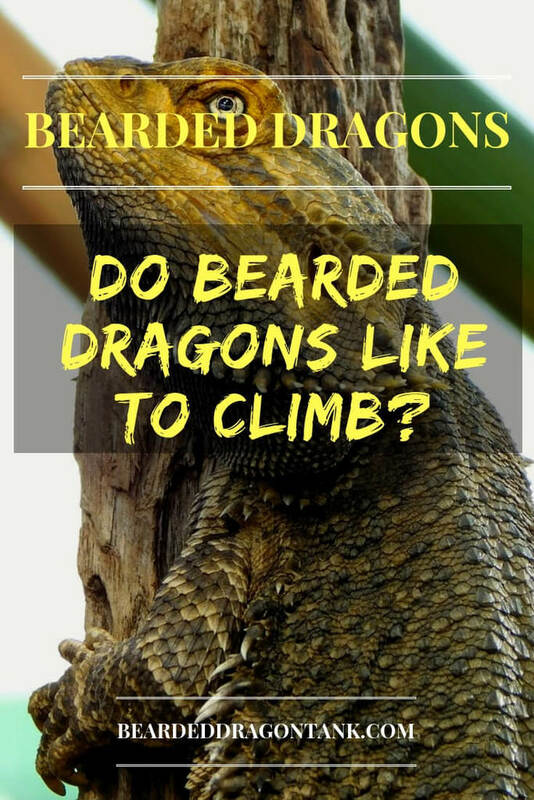 Do bearded dragons like to climb? In the wild, bearded dragons often climb on trees or other high places to have a good view. This helps them to see predators or other bearded dragons earlier. So while bearded dragons in captivity are mostly kept in long, but not tall terrariums, they are actually very good climbers and like to climb. However, does that mean that you have to get a new terrarium now? And what should you get for your bearded dragon to climb on? Logs? Branches or stones? Continue to read to learn more. Do Bearded Dragons Like To Climb? There are bearded dragons that are not as active as others, but all bearded dragons have an urge for movement and they also have an urge for climbing. In fact, in the wild of Australia, you can see a lot of bearded dragons lying on trees, high rocks or even fences. Actually, in the wild, bearded dragons that want to flee from a threat often times run to trees in order to hide. They run to a tree, climb on it and rely on their body color, their natural camouflage. It almost looks like bearded dragons melt with trees, because their camouflage works so good with them. Their claws are perfectly shaped for climbing trees and other rough surfaces and they can climb very quickly. If they see a possible threat, they simply jump down the tree and run to a safer place or they fight off the threat. Besides that, if bearded dragons are kept in a group, you can see the alpha male always lying on the highest place possible. Yes, even though bearded dragons should not be kept in groups, they also have alpha males and the fact that they always choose the highest place as best place says a lot. If you want to know why bearded dragon should not be kept together, read this. So as you see, bearded dragons like to climb and they have no problems to climb quickly to the top of whatever they climb and come down even quicker. Why Are They Kept In Long Tanks Then? Most people simply do not know that bearded dragons climb a lot. It is not known why only long terrariums have established for bearded dragons instead of long and tall terrariums. However, even though bearded dragons can climb pretty high, it doesn´t mean that bearded dragons need to do that. It is also okay if you just give your bearded dragon the opportunity to climb, if it can´t climb highly it´s not a problem. At least it can climb. So if you have a tank that is only long, but not very high, that is totally fine. However, if you want to get a new tank in the future, think about getting a tank that is long and tall. What Should You Get For Climbing? It is best to get some branches and position them horizontally, but also vertically, to give your bearded dragon a very natural climbing experience. Logs and branches made of cork are great for bearded dragons to climb on as they have a very rough surface which is optimal for a bearded dragon´s claws. However, that doesn´t mean that only cork is great for bearded dragons. You can take any branches you want as long as they have a rough surface and your bearded dragon can´t get hurt climbing on them. So for example, bamboo should not be put into a bearded dragon tank as bearded dragon´s can´t climb on it. You can even bring branches from outside and put them into the tank as long as they do not contain any pestizides. This way you can create a very natural habitat for your bearded dragon without spending a lot of money. Still, if you want to buy some pieces of cork for your bearded dragon, I recommend to get this cork bark. It is not only great for climbing, it is also great for hiding. 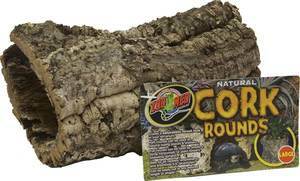 Combine this cork round with a couple of other branches and your bearded dragon can climb all day. You should still leave some space for your bearded dragon to walk normally though. Further, you should make sure that your bearded dragon can´t get too close to the heat bulb while climbing. Creating a basking spot is okay, but if your bearded dragon can get too close to the heat bulb your beardie could be burned easily. There are a couple of further common questions on bearded dragons and climbing that I´d like to answer in the following section. Do Bearded Dragons Like To Climb High? Yes, bearded dragons like to climb very high. The higher they climb the better their view and that is what bearded dragons want. In the wild, people found bearded dragons in trees at a height of 2 meters and higher. Do Bearded Dragons Climb Trees? As I said, bearded dragons love to climb trees and trees are excellent as bearded dragons are perfectly camouflaged on them. However, bearded dragons can´t climb on all trees. They prefer trees with a lot of branches and with a rough surface that makes climbing easier for them. Can Bearded Dragons Climb Walls? Bearded dragons can climb some walls, but it always depends on the surface. If the wall has a very rough surface, a bearded dragon will be able to climb it. However, they do not climb walls as easily as most geckos do. Can Bearded Dragons Climb Glass? So if your bearded dragon tries to climb the glass of its tank, it is probably doing something that is called glass-surfing. This can have several reasons, from seeing food on the other side of the room to wanting to get out of the tank. Can Bearded Dragons Climb Stairs? Yes, bearded dragon can climb carpeted stairs or other stairs with rough surfaces. Some bearded dragons can even climb stairs with slippery surfaces as they can jump pretty well, too. Bearded dragons do not only like to climb, they are actually made for climbing and do so in the wild every day. However, you don´t have to get a new tank now, it is enough to put some branches and logs into the bearded dragon tank so that your bearded dragon can at least climb a little bit. Next Next post: Do Bearded Dragons Lay Eggs? They Do!